"Dogs and fleas can quickly become a problem for your pet and then multiply in your home.To stop an infestation, follow the steps outlined below including giving your dog a bath/dip to kill fleas that are on your dog, followed by a preventative (see table). Be sure to clean your home, vacuum thoroughly and use a borax based cleaner for the carpet. " Like other parasites, fleas (Ctenocephalides felis) feed on the blood of their host. In this case your dog. They jump on the dog, feed and then jump off into hiding. 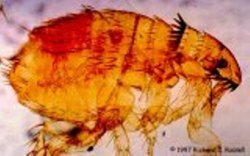 When a flea bites they inject saliva into the skin of your dog. The flea bites or red bumps you see are the results of a mild allergic reaction to the saliva in the fleas mouth. Approximately 40% of dogs will have an allergic reaction to a flea bite. Fleas if left untreated can cause anemia (low red blood cell count) in dogs. A dog can die if a severe case is not treated. It is possible for fleas to give your dog a case of tapeworms. Dogs and fleas can be an on-going battle. Expect to keep after them until they are removed from the home and your dog and fleas problem goes away. This AVMA podcast featuring Dr. Bernadine Cruz provides a helpful overview of dog flea symptoms, treatment and prevention. For more information on home flea treatment click here. If you comb your dog and see small dots (flea eggs look like salt and pepper) then your dog probably has fleas. If your dog is brushed onto a sheet of wet white paper, it will make red and brown marks from the blood that the flea ingested. Bites tend to appear seasonally, with outbreaks usually occurring in the summer and fall. Flea bites are usually seen in the back half of your dog, particularly around the tail. Other areas affected include the thighs and groin. You may notice your dog not being comfortable such as frequently biting at their tail. Beyond the red bumps caused by a canine flea bite, each bite can cause your dog to each for several days. If the flea infestation is allowed to get worse, your dog may lose her hair and the skin will become inflamed. Treatment for dogs and fleas has multiple steps including removing the fleas from both your dog and your home. There are natural and chemical options, each equally effective. Most owners use a combination of shampoo/dip to initially remove the fleas from your dog, an adulticide in the form of a spray or powder to kill fleas on contact and then what is known as a insect growth regulator (IGR) to interfere with the flea reproduction cycle. Common ingredients in IGR's include methoprene, fenoxycarb and pyriproxifen. Sprays include ingredients such as Fipronil imidacloprid or selamectin. 1. Bathe and Dip your Dog: To remove fleas from your dog, consider a medicated shampoo that is made specifically to kill and repel fleas such as Bayer Anima Health Advantage Shampoo. 2. Comb Your Dog: Use a flea comb after bathing to remove any fleas that remain in your dogs coat. Note that your dog may still show some reactions even after the fleas are gone since the skin reaction may take some time to disappear. Dip the comb in soapy water to kill any fleas on the comb. 3. Treat Itch with Supplement: If your dog is suffering from itch, consider a natural homeopathic supplement for relief such as Allergy Itch Ease. Another option for severe dog itch is to have your veterinarian prescribe conventional medications containing oral steroids or an antihistamine. 4. Prevent Fleas From Returning to Your Dog: Select one of the popular flee spot-ons, collars or powders. As mentioned, effective ingredients include pyrethin, etofenprox or etofenprox. Make sure the product you select actually repels or keeps the fleas away from your dog, since some products only kill the fleas after they have bitten your dog such as IGRs (insect growth regulator). Read the label and check for safety is using with pregnant dogs, older dogs or puppies. Advantage (Imidacloprid) Applied 1x per month to the back of your dog. Works without fleas biting your dog. Advantix (Imidacloprid) Similar to Advantage, but also kills ticks. Works without fleas biting your dog. Topical applied in liquid form to a spot between your dogs shoulders. Frontline (fipronil) Working without fleas biting your dog. Lasts up to 90 days. Do not use on Puppies under 10 weeks. Topical applied in liquid form to a spot between your dogs shoulders. Program (Iufenuron) or Sentinel (Iufenuron and Interceptor) - Recommended Given to your dog orally 1x a month. A very popular approach. Takes 30 to 60 days to work since it interferes with the flea lifecycle. Builds up in your dog's skin and works when the flea bites. Combine with other shampoo and dip products mentioned in step 1. The program alone is fine after 60 days. Sentinel also kills heartworm, hookworm and whipworms. 5. Remove Fleas from Your Home: You can purchase a disinfectant such as Benzarid which is effective at removing fleas from your home. They also sell natural fossil dust which could help as well. Be sure to clean the area where your dog has been by vacuuming within a day of treating with a bath, dip and product such as Program, Sentinel or Frontline Plus. Clean your dogs bed as well. 6. Treat other Pets in the Home: Fleas could jump to other pets such as cats. Make sure all are being treated. For flea control carpet cleaning, try a product called Fleabusters Rx For Fleas Plus. It kills fleas for up to a year. One 3 lb container should be enough to treat several rooms in the average home using borax as the active ingredient. 7. Consider Adding Garlic and Brewers Yeast to the Diet: By adding these ingredients to your dog's food, the fleas will find your dog less appetizing. You can also use vinegar to kill fleas as a natural remedy for your dog. 8. Naturally Treat Outdoor Areas: Nematodes, which are microscopic worms, are available from most garden centers. The worms naturally fade away once the fleas have been removed. If you have young children in the home be sure to read product labels before using products for dogs and fleas. Other products such as electric sonic collars are not that effective. For more information download this brochure from the American Veterinary Medical Association on external dog parasites (PDF) such as dog fleas. Have a Dog Flea Related Question or Helpful Story? Please take the time to include as much detail as possible as it will improve the usefulness of the answer we provide. Also, Please include a picture below (optional).